“Less overtly adventurous than its predecessor, Empyrean Isles, Maiden Voyage nevertheless finds Herbie Hancock at a creative peak. In fact, it’s arguably his finest record of the ’60s, reaching a perfect balance between accessible, lyrical jazz and chance-taking hard bop. By this point, the pianist had been with Miles Davis for two years, and it’s clear that Miles’ subdued yet challenging modal experiments had been fully integrated by Hancock. Not only that, but through Davis, Hancock became part of the exceptional rhythm section of bassist Ron Carter and drummer Tony Williams, who are both featured on Maiden Voyage, along with trumpeter Freddie Hubbard and tenor saxophonist George Coleman. “The sea has often stirred the imagination of creative minds involved in all spheres of art. There still exists an element of mystery which surrounds the sea and the living aquatic creatures which provide it with its vital essence. Atlantis, the Sargasso Sea, giant serpents, and mermaids are only a few of the many folkloric mysteries which have evolved through man’s experiences with the sea. Before the dawn of water is clear and quiet, the small movement of the waves rhythmic it is a stillness in itself. The birds are silent, and the beach is as empty as the sky, except for a few small crabs that poke among the rocks, looking for food tinier than they. As the first hint of gray suffuses the horizon and imperceptibly lightens the deep black waters, a light wind ruffles the tips of the wavelets, whitening their crests with tongues of foam. Slowly the sand gains life, the grayness of the starry night becoming faintly yellow, a forerunner to the blazing white of noon. In this empty hour the busy world is shrouded in loneliness. Half-buried cans glint weakly in the diffused light, and as the day grows broader, the whole length of the beach slowly becomes visible, vast and silent, the discarded residue of humanity scarring its desert purity. Metal wastebaskets are dotted over the landscape as far as the eye can see, looking strange and useless, as desolate as gravestones. A single ship, perhaps on her maiden voyage, her mast a black spike against the sky, hovers near the horizon, until the curving waters sink her sail from view. The sand twinkles in the growing day, but all too soon the sea will break on a shore of people. Gone will be the huge, secret silence, as the masses stream from the city behind, scurrying madly like lemmings to the waiting strand. But through the land may submit, the sea is yet implacable, changeless, and though the people, deeming themselves brave, tiptoe out from the edge of the land and splash in the shallows, tasting the salt, they can but shiver on the fringes of her mystery. Her vastness remains dark and secret, a misty world of silence and beauty and fluid grace. From the great sluggish sea turtles gliding in slow motion through the depths, to the swift and playful dolphins, jesters and intelligentsia of her kingdom, everything in the sea moves constantly in flight or pursuit. To us a playground or a symbol of peace, to her creatures the sea is a water jungle, a world of swift life and swifter death, whose silence cloaks a lurking danger. Killer whales, cruel kings of the sea, cruise slowly about, slaying for the love of blood and battle. Sea anemones, beautiful and deadly, wave their tentacles, beckoning small fish to death by poison. Like the land, it is a world where the small and timid must be swift and clever at hiding, where the strong prey on the weak, the weak on those more defenseless than themselves, a world where only the fittest survive. Ancient tales speak of its beauty and danger, of nameless terrors that lurk in the shadows, awaiting the unwary, of fantastic monsters rearing vast and hideous heads from the depths, crunching ships in tow with one snap of their jaws. This rejected (and lost) session is a mystery. Clearly from the titles recorded that day. (“Maiden voyage,” “Dolphin Dance” and “Little One” this date was to be the Maiden voyage album. Freddie was listed on cornet, George Coleman was on tenor, Herbie, Ron Carter on bass and…Stu Martin on drums. This session is listed in the Blue Note files but no tapes have been found. Stu Martin had recorded with Herbie on a Sonny Rollins session (for RCA), and had been with Gil Evans during 1964. We don’t know the reasons for Mr. Martin’s presence, and with no aural evidence, one can only speculate as to how the music sounded. 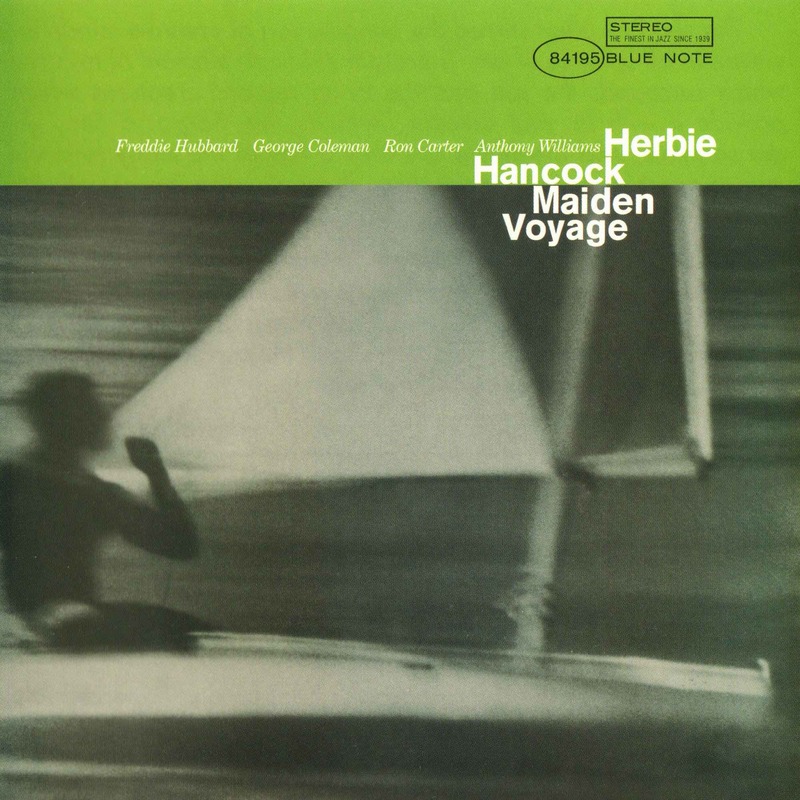 Herbie went back into the studio for Blue Note and recorded one of jazz’s all-time great albums Maiden Voyage (BN-4195). Freddie was now on trumpet, George, Herbie and Ron were there, and now Tony Williams was on drums. The music recorded on this day remains fresh and vital. The compositions are among the most favored by jazz musicians all over the world. “Maiden voyage,” the title track, has been covered by hundreds of artists. As the year 1965 rolled around, Miles took his Quintet to the West Coast, and broke house records at Basin Street West, a posh San Francisco nightspot. The quintet headed for Los Angeles and went into the Columbia Hollywood studios to record their first studio album. From January 20th thru the 22nd, the Miles Davis Quintet recorded the album ESP (Columbia CL 235O). Herbie’s composition “Little One” was recorded. “Maiden Voyage’ is a simple composition, a variation on the 32-bar song form. The harmony is based on what jazz musicians call “sus chords.” The sus chords used in “Maiden Voyage” are based on the dominant seventh. The inspiration for this sound came from the coda to “Eighty-One”, recorded on the Miles Davis ESP album. After the final melody statement of “Eighty One”, Herbie lands on an F7sus and repeats a rhythm which is now known as the “Maiden Voyage’ pattern. The performance by this studio band (why was Wayne Shorter not on this date?) is classic. “The Eye Of The Hurricane” is a 12-bar minor blues set off by a melody statement that changes meter on the 7th measure. The melody form subverts the blues form, but follows it closely. All of the solos are hot, especially Freddie, who gets inspired by minor blues changes. Little One” is a waltz with a difficult, non-cliche solo form. It opens with a rubato statement and then enters the 84 pulse. “Little One” closes with a repeat of the rubato section. “Survival Of The Fittest” follows in the tradition of “The Egg”. It is pure improvisation, but the musicians are improvising with open expressiveness. Once again Herbie has mixed up funk and freedom. This classic album closes with one of jazz’s prettiest compositions, the lovely Dolphin Dance. Recorded (probably) as much as “Maiden Voyage.” “Dolphin Dance” is a unique Hancock original, with the form as challenging as the harmony. Vamps, odd cadences and tricky modulations capture the essence of this song. Herbie’s solo is memorable; he sustains the feel of the music and with his build up at the end (Tony Williams makes it easy) adds a sense of drama to the performance. The album Maiden Voyage was a hit. Herbie remarked, but only in the jazz circle.’ But someone at Yardley Perfumes must have been in that circle, because shortly after Maiden Voyage was released, Yardley asked Herbie if they could use the title track for one of their television ads. Herbie consented and soon, “Maiden Voyage’ was reaching a larger audience, even if by the route of the jingle. The impact Maiden Voyage has had on musicians is still evident today. How many songs have that “Maiden Voyage” vamp implied, or intended, in their structure? This album is indeed a classic, worthy of the praise. The next month, (April 14) Herbie was involved in a Stanley Turrentine big band date for Blue Note (Joy Ride BN-4201) that Oliver Nelson had arranged the music for. Oliver had hired Herbie when Herbie first came to town, and trusted him to provide sensitive accompaniment behind Stanley and the big band. “Little Sheri” is a standout containing a fantastic Herbie solo. That same day, Miles Davis underwent a serious operation on his hip, the result of a bad car accident. This meant that the Miles Davis Quintet was going to be inactive for a while. Herbie landed a gig at the Village Vanguard as an intermission pianist in May (opposite Sonny Rollins). On May 23, 1965, Blue Note assembled Herbie, Ron, Freddie and Joe Chambers to record Sam Rivers’s album Contours (BN-4206). The album is stunning, a high level of jazz playing is evident throughout the recording. Herbie plays fantastically on every song, and his solo on “Mellifluous Cacophony” is superb. During that solo, Herbie concentrates on a “right hand” solo, his left hand almost silent. (Herbie would later crystallize this sound on the Miles Davis album Miles Smiles a year and a half later). By June, Herbie’s solo gig at the Vanguard had expanded into a trio with Ron Carter or Richard Davis on bass and Tony Williams on drums. The trio gigged in Baltimore and then with Wayne added, hit the Vanguard (billed as the “Miles Davis Quartet”). In the July 29 issue of Down Beat, there is a photo of Herbie with Wayne, Tony and Richard Davis from the Vanguard. On June 10, 1965, Herbie recorded with Bobby Hutcherson (Components BN-4213). Bobby and Herbie were reunited, and from this session forward, they would record together often. Also on the date are Freddie, Ron and Joe Chambers. The title track stands out as superlative Hancock. On June 14, 1965, Wayne Shorter recorded an album for Blue Note. On piano was Herbie, Cecil McBee was on bass, and Joe Chambers was the drummer. This session was not issued until 1978 in Japan as Wayne Shorter The Collector (GFX-3059) and, in the US in 198O, as Etcetera (BİN-LT-1O56). As Miles lay in his bed recuperating, the members of his quintet were spreading themselves all over the place. Herbie worked with Milt Jackson in Philadelphia from July 12-17. On August 12, 1965, Tony Williams recorded his album Spring (BN-4216) for Blue Note. Herbie played on two tracks. The other musicians were Wayne, Sam Rivers and Gary Peacock. Soon after this recording, a verite tape from a club was made of Herbie, Wayne, Tony and an unidentified bassist (claims that Gary Peacock or Art Davis were on this gig have persisted despite denials from Peacock). The tunes played during this set included Herbie’s “The Eye Of The Hurricane” and Wayne’s “Oriental Folk Song” and “Virgo.” On September 17, Herbie was in Rudy’s sound factory recording with Lee Morgan. The date was rejected, and the next day the date was completed. The album was Lee Morgan Cornbread (BN-4222), and Herbie’s solo on “Ceora” is a definitive example for anyone who really wants to feel the power of Herbie’s touch and ideas. The solo is simply a masterpiece. The album itself is classic Blue Note, with Hank Mobley and Billy Higgins lending so much to this feeling. Herbie started getting calls for commercial jazz dates, and one of the first was the Donald Byrd “Up With…” sessions for Verve. Dave Pike hired Herbie for his rock-influenced album Jazz For The Jet Set (Atlantic SD-1457). Dave recorded Herbie’s tune “Blind Man, Blind Man.” The date took two sessions to complete (October 26 and November 2, 1965). On November 20, Herbie was called to participate in Wes Montgomery’s Goin’ Out Of My Head (Verve V-8642) as a session player. This session would solidify Herbie’s future as an in-demand sideman. By this time, Miles Davis had recovered and was back in action. The first gigs were in Detroit at the Grand Bar. Gary Peacock was the bassist. By November, Miles was in Philadelphia at the Showboat with Reggie Workman on bass. This version of the Miles Davis Quintet hit the Vanguard in Greenwich Village and the Bohemian Caverns in Washington, D.C. By the end of December, Ron had rejoined in time for a two-day recording session for Columbia in Chicago. Miles Davis: The Complete Live At The Plugged Nickel was recorded on December 22nd and 23rd. It is a marvelous example of the quintet throwing caution to the wind. Obviously slowed down by Miles’s hip problems, the quintet pushed further that week than they realized. Herbie was liberated by the band’s enforced off-time, and his solos and comping are a true delight, fresh and exciting, and filled with a sense of wonder and discovery. Columbia released only parts of the two nights in 1977 and 1978 (in Japan and in 1985 in the US), before releasing everything in 1995. Miles returned to New York and began a weekend-only policy at the Vanguard, which lasted about a month. Herbie made Woody Shaw’s demo session (with Joe Henderson, Paul Chambers and Joe Chambers) that was eventually released as In The Beginning in 1989. Nat Adderley hired Herbie to play on his Sayin’ Somethin’ date for Atlantic (SD-1460) On January 13, 1966. “Cantaloupe Island” was recorded. On February 3, 1966, Herbie recorded the title track for Wayne Shorter’s album Adam’s Apple (BN-4232), followed by a February 8 session for Blue Note under Bobby Hutcherson’s leadership. The album was called Happenings (BN4231) and it was a quartet with Bobby, Herbie, Bob Cranshaw and Joe Chambers. “Maiden Voyage” was recorded at this session. Happenings is an incredible display of Herbie’s power and strength. The musicianship level on this date was stunning. On February 24, Herbie Completed Wayne’s Adam’s Apple date. “The Collector” an abstract composition by Herbie, was recorded at this session. In 1968, Miles recorded this song and it was released in 1980 as “Teo’s Bag,” and erroneously credited to Miles Davis. Herbie returned to the studio On March 5 to record two titles for a Freddie Hubbard session. On the date were Joe Henderson, Reggie Workman and Elvin Jones. The music was not released until 1987 (on Freddie Hubbard’s Blue Spirits CDP-46545). On March 28th and April 1st, Herbie played piano for Kai Winding’s Verve album Dirty Dog (V- 8661), which included “Cantaloupe Island” and “Blind Man, Blind Man.” From April 18-20, Herbie played on Ed Thigpen’s Verve album Out Of The Storm (V-8663). Maiden Voyage was recorded but never issued, and the album featured Clark Terry, Kenny Burrell and Ron Carter. Miles was working sporadically at this time, so Herbie had plenty of time to take sessions. Miles spent a week at the Bohemian Caverns the latter part of May. Clearly, Herbie was in demand not only as jazz soloist, but as a session player and composer as well. By June, Herbie had started to sub for Hank Jones in Benny Goodman’s band at the Rainbow Room at the top of Rockefeller Center Music Masters has released some of this material which includes a great Herbie solo on “Avalon”. July 4th found Herbie back with Miles’s Quintet at the Newport Jazz Festival. On July 15, The Quintet appeared at Lewisohn Stadium, but soon Miles was cancelling gigs as fast as he could take them. On July 19, 1966, Herbie went to Rudy’s to create a session based on soul and funk-jazz. The sidemen included Stanley Turrentine, Melvin Lastie on cornet, Garnett Brown on trombone, Pepper Adams on baritone sax, and a rhythm section consisting of Billy Butler and Eric Gale on guitar, Herbie on piano, Bob Cranshaw on electric bass and Bernard Purdie on drums. The session was a noble experiment. “I was trying to make a funk record without knowing a thing about funk,” Herbie said to me. “I really wasn’t ready, I hadn’t really gotten fully into rock music by then, I was still sort of a jazz snob, and the date didn’t turn out as I expected.” Of the six tracks recorded that day, Only one track is included on this collection called “Don’t Even Go There.” This track captures the spirit of this session. The next day, Herbie hit the road for Chicago to work with Miles for two weeks at the Plugged Nickel (July 20–31). Eddie Gomez was on bass. By August 7 the Quintet was in Detroit and on the 8th played the Ohio Valley Festival in Cincinnati. Verve called again on September 14-16 for Herbie to play on Wes Montgomery’s California Dreamin’ album (V-8672). During this time, the Miles Davis Quintet worked at the Village Vanguard. On October 24th and 25th, Miles Smiles (Columbia CL 26O1) was recorded, arguably one of the most spectacular recordings in jazz. One cannot say enough about this recording, and it showcases Herbie in an unusual way. He’s noticed for not playing, the art of laying out during Miles’s and Wayne’s excursions. The finest track on the album is “Circle”, in which Herbie expands the language of jazz piano through his classical training. Herbie’s solo literally improvises Chopin and Ravel in a natural jazz style. The style and focus of this album is an extraordinary event in jazz history. Herbie got a big break when Michelangelo Antonioni asked Herbie to score his art film Blow Up. In November 1966, Herbie put together a great band to record the music, which consisted of loose sketches and cues. Joe Henderson, Phil Woods, Freddie Hubbard, Jim Hall on guitar, Ron Carter and Jack DeJohnette on drums (who would be subbing for Tony at the Vanguard). The title track “Main Theme From Blow Up” was recorded later by Bobby Hutcherson, but lately “Jane’s Theme” has been discovered and covered by a new generation of jazz artists. The rest of the music has elements from all of Herbie’s Blue Note records, and shows a few surprises as well. The compositions are bold and adventuresome, with a healthy touch of the romantic. This film gave Herbie a very public cachet, and soon the music industry was taking a closer look at Herbie’s career. Creed Taylor started calling Herbie more frequently. December 2nd and 6th were reserved for Stan Getz’s Verve album Voices (V-8707). Miles settled in at the Village Vanguard for three weeks (with Jack DeJohnette on drums) and Herbie was in town to do sessions. Concept albums more often than not turn into attenuated exercises in pretense. Not so with this album, which has to be considered on of the all-time jazz masterpieces. There is an aura surrounding the melodic material and the rhythms, particularly the ebb-and-flow washed of Tony William’s drums, that sustain the nautical conceit; and the musicians respond in the spirit of wonder, adventure, risk, awe and joy appropriate to each track. The band assembled here might be considered an edition of the Miles Davis quintet with Freddie Hubbard in the trumpet chair. As such, it reinforces the conclusion derived from Hancock’s previous Empyrean Isles – that, in Rudy Van Gelder’s studio under Alfred Lion’s supervision, the Hancock/Carter/Williams troika produced music every bit as magnificent (and far better sounding) than the justly-celebrated Davis quintet recordings for Columbia. Hubbard, who had played cornet on Empyrean Isles nine months earlier, is back on trumpet here, while George Coleman is added on tenor sax. Coleman’s presence is a bit unexpected, given that he had left the Davis band in 1964 and that his ultimate replacement with Davis, Wayne Shorter, was a Blue Note leader who one assumes was as available as the rest of Davis’ band. Perhaps Hancock felt that Coleman had not received sufficient opportunity to display his skill in the context of newly-minted material during his tenure with the trumpeter. In any event, Coleman proves the model of eloquence here, and these solos remain among the most exquisite he ever recorded. The work of Hubbard and Williams deserves special mention. Hubbard takes his horn into areas on the title track and “Eye Of The Hurricane” that galvanize the music, coming as close to translating the expressive innovations of John Coltrane to the trumpet as any brass player ever got. (In a recent conversation, Hubbard acknowledged that the extended techniques heard here, and on his equally immortal solo on Oliver Nelson’s “Stolen Memories,” were directly inspired by Coltrane, and opined that such blowing may have contributed to his later embouchure problems.) For all of the “edge” that these flurries impart, Hubbard still turns in one of his most melodic performances. He often performed better as a sideman than a leader, especially when he worked on Hancock’s projects. Williams, for his part, never turned his sixth sense for percussive nuance more finely than he did on this session, where he captures every metaphorical breeze and droplet in Hancock’s compositions. The compositions are among the classics of the period. Hancock had, at least temporarily, set aside the funky inclinations expressed so convincingly on “Watermelon Man” and “Cantaloupe Island,” and was plumbing the challenging harmonic terrain where beauty and experimentation coexist so brilliantly. For this album, he provided five distinct yet complimentary structures, two of which (“Maiden Voyage” and “Dolphin Dance”) continue to be as frequently covered as any jazz originals from the period. It makes Hancock’s achievement only more impressive when one realizes that the tunes were not originally conceived as a five-part suite. “Maiden Voyage” was written as background music for a TV ad; and the non-oceanic though emotionally fitting “Little One,” previously recorded by the Davis quintet with Shorter on the Columbia album ESP, was (like Hancock’s subsequent composition “The Sorcerer”) a tribute to Davis. Or check out this record, because Hancock brought those strategies for conjuring and slyly shaping a tune into his own projects. Maiden Voyage, arguably his peak solo statement from the 1960s, appropriates elements of the Davis group dynamic for a transfixingly understated meditation on the lure of the sea. It’s a classic that’s justifiably revered for its compositions and its solos, and also, perhaps most importantly, the rich and delicate interactions that run throughout. The album is a perfect case study in the art of group interplay; it offers an array of thoughtful answers to the question “How, exactly, does conversation happen in jazz?” Hancock starts with the notion of melody: Each of these five pieces is built around a singable theme, one that’s durable enough to be inverted, paraphrased or passed around the group in the heat of improvisation. The melodies of Hancock’s tunes serve as a kind of through-line, echoing in the margins. Hancock refers to his themes, in oblique ways, when accompanying trumpeter Freddie Hubbard and tenor saxophonist George Coleman: He’s cultivating an atmosphere of expansive openness, and sometimes those glancing references help remind everyone involved about the dimensions of the canvas, the color palette and overall tone. This tactic proves particularly wise on the deceptively challenging “Dolphin Dance:” The mood is placid but the solos get stormy, and whenever it seems like the music is about to fracture, Hancock slips in some little phrase that gathers everyone back together. Recorded on March 17, 1965 at the Van Gelder Studio, Englewood Cliffs, New Jersey. Originally issued as Blue Note BLP 4195 and BST 84195.